Named a Superior Supporting Actor of 2018 by Lavender Magazine in their #8 Best Show of 2018: PETER AND ALICE. 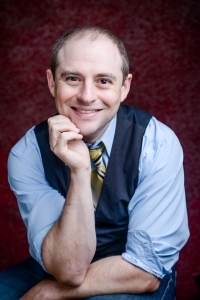 Actor, Producer, Director, Matt Saxe has performed theatre and improv in Los Angeles, CA., Chicago, IL, Atlanta, GA. The Twin Cities and St. Cloud in Minnesota, St. Louis, MO. and Alabama. He is a member of SAG-AFTRA and has over 100 film, TV, and theatre credits. Continuing: LAST ACTION MOVIE-The Unscripted Improvised Theatre Company-Various locations including Phoenix Theater, HUGE, STRIKE, The Black Forest Inn, & Improv festivals around the U.S.
STRIKE Theater Sat Nov 11th. 2017, and as part of IMPROVATHON 2017 at HUGE Theater on GIVE TO THE MAX DAY. HUGE Theater-Last Saturday of the month at 4PM: Performed LAM-THE 90-MINUTE SET, July 15th at HUGE Theatre. Video of the 90-Minute Set for Sale! Contact me to order video. Performed at 2012 Chicago Improv Festival. An original play based on true stories from an Israeli humanitarian organization that provides free life-saving heart surgery for children worldwide. Seven-year-old Maria from Romania was born with a rare heart disease that has no cure in her home country. When brought to Wolfson Hospital in Israel for surgery, Maria makes friends with a little girl from Gaza, a college student volunteer from Illinois, and doctors who have already saved over 4,500 children from 55 different countries… While the doctors strive to mend the children’s hearts, the children set their hearts on fixing the entire world. Sunday, June 17: 3 p.m. and 6 p.m.
Sunday, June 24, 4 p.m.
BRING IT ON:A Drinking Game-Minnesota Sat May 5th. "A work of Theatrical Genius...Candid Theatre’s beguiling and deeply moving regional premiere of the Olivier nominee at Fallout Arts Initiative rises to the occasion with memorable performances that border on sublimity and linger in the mind long after the curtain call...The vivid supporting cast is superb as they appear as phantoms from Alice and Peter’s past. A terrific Matt Saxe spirits forth the brusque machismo that one can imagine James Barrie would have embodied if we consider the boyishly adventurous imagination the man surely must have been driven by....Logan’s heavyweight themes are brilliantly rendered with expert variation, pace, and timing by all, so that the show moves briskly along." "Reality, memories, and imagination all mix together to tell a moving story of the joy and pain of growing up in Candid Theatre Company's wonderful and intimate production of PETER AND ALICE...It's a captivating, thought-provoking, sobering 90 minutes... Matt Saxe is a boisterous force of life as J.M. Barrie. Peter and Alice is a fascinating exploration of two characters we think we know, and the contrast between the stories of our childhood and the harsh reality of adulthood. I was completely charmed, and saddened, by this production." Producer/Director/All of Michael Palins Roles--Swallow Savvy Guard, Dennis, Sir Galahad the Pure, Narrator, Leader of the Knights Who Say Ni!, King of Swamp Castle, & Others. "Last night, I was thrilled to watch it come alive before me in Chameleon's excellent production with a really wonderful cast, elegant design, and clear direction. It's quite a treat to revisit a play I fell in love with 22 years ago, and discover I love it even more now." "Director Duck Washington has assembled a great team here and they’ve breathed life into a story that’s often a lot of fun." "Sheep Theater is premiering a comedy that sits right next to Citizen as one of the best and most important pieces of theater I’ve see so far this year....Rogers as Franz Ferdinand has backup on his side of the conflict from Goetzke, Mobley, Torsch, Wrolson, Madeleine Rowe, Matthew Saxe, and Josiah Thompson. You need to see these people in action....5 stars - Very Highly Recommended"
"History geek or not, The Assassination of the Archduke of Austria-Hungary Franz Ferdinand is something you definitely want to see....You don’t need to be an expert in history to love this show." Producer/Director/Veronica’s Dad, Big Bud Dean-JD’s Dad, Principal Gowan, Officer McCord, Father Ripper, Mr. Kelly-Kurts Dad, Paul Hyde, & Others. Producer, Director, Sterling Malory Archer. HUGE THEATRE-Give-To-The-Max Day. Thurs Nov 17th. Produced by Shadow Horse Theatre, LLC. Producer, Director, Dr. Stratford, Bogey, Others. Producer, Director, Jabba the Hutt, Yoda, Admiral Ackbar, Emperor Palpatine/Darth Sidious. Roles: Delmar O'Donnell, Homer Stokes, Producer, Director. With Special Guest Star: Erik Stolhanske of BROKEN LIZARD!!!! AMERICAN MIDGET by Jonathan Yukich Produced by Shadow Horse Theatre. Feb 6-22 2015 Phoenix Theatre. Roles: Dribbling Jones, Dr. Kalamazoo, What You Need. "Enter Matthew Saxe as psychologist Dr. Kalamazoo in my favorite role for Saxe to date. He chides Albert for having “non-midget notions,” which made me chuckle, but we also get to learn about his childhood hopes and dreams to better connect us with him. Saxe portrays Kalamazoo’s development with so much heart, you’ll find yourself (literally) cheering for him by the end. You’ll also have the pleasure of being thoroughly creeped out by Saxe’s What You Need character, and I’ll just leave it at that. Yeah. Ew." Roles: Harry Burns, Producer, Director. HAUPTMANN by John Logan Produced by Candid Theater Co.
"Matt Saxe beguiles as prosecuting New Jersey Attorney General David Wilentz." "Candid Theater Company's current production presents a fascinating and compelling drama with the barest of sets and costumes and a cast full of new young talent....Matt Saxe is the cruelly efficient prosecuting attorney, relentlessly badgering Hauptmann until he gets the answers he wants." Roles: Yoda & Others, Producer, Director. "Matt Saxe is chilling as Mengo." Shadow Horse Theatre at the Old Arizona Feb 1-23 2014 7PM Thurs-Sat, 2PM Sundays, Pay-What-You-Can on Valentines Day! "The true fun of this play (as in most fairy tales) lies in the “villains” Lucy Andrews (Bethany Ford Brinkley) and Max Brockman (Matthew Saxe). Both Brinkley and Saxe seemed to be having a great time and this helped improve the energy of the show. Even when you wanted to hate them, you just kept hoping they would come back onstage so you could see what they were going to do next." FERRIS BUELLERS DAY-OFF: A Drinking Game-MN. SHAUN OF THE DEAD: A Drinking Game-MN. Roles: Oedipus, Bill The Villain, Peter Petrovich, Pallo, Cat, John Q. "Big" Business, Godot, Clives the Butler. Sat Feb 9th at 9:30PM Bryant Lake Bowl-Special 1-year Anniversary Show! "Christina Ham’s “Crawlspace” is absorbing and brutal, cramming a lot of harsh reality in a very short space. Matt Saxe and Rachel Linder handled their edgy characters with confidence." RAUCOUS CAUCUS III-Box Wine Theatre at the Bryant Lake Bowl Jan 2013. "Doctor There's A Government in my Uterus"
American Premiere of the hit of the 2011 Vancouver Fringe Festival. This play is about Driscoll, a simple Irish fisherman and his wife Muirin whose strange and mercurial ways challenges his reality. Is her dark side something to which he may lose her or is she a special and mystical creature of legend? Friday July 20th 9:30 The Bryant-Lake-Bowl. BACK TO THE FUTURE: A Drinking Game-MN! Friday June 29th 9:30 The Bryant-Lake-Bowl. THE PRINCESS BRIDE: A Drinking Game-MN! The Inconceivable Return! Sat May 19th 9:30 PM Bryant Lake Bowl a return engagement after the sellout inaugural performance of THE PRINCESS BRIDE: A Drinking Game, Feb 5, 2012. March 23, 2012, BLIND DATE-The Ordway, St. Paul. "The Date" with Rebecca Northan. August 2011: MACBETH-Seyton-Theatre Coup d'Etat http://www.theatrecoupdetat.com/MacBeth.html First Theatre Coup d'Etat production in Minnesota. 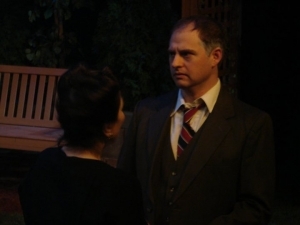 Jan 2011-WASH MY SIN AWAY at blank slate theatre for Theatre Terra Firma as Mickey. Jan 13-15 and 20-22 2011. Selected for Week of Slovenian Drama in Slovenia. A KLINGON CHRISTMAS CAROL/Q'upa/Mounds Theatre, St. Paul, MN. THE ASSASSINATION OF THE ARCHDUKE OF AUSTRIA-HUNGARY, FRANZ FERDINAND/Count Istavan Tisza/Sheep Theater/Minneapolis, MN. 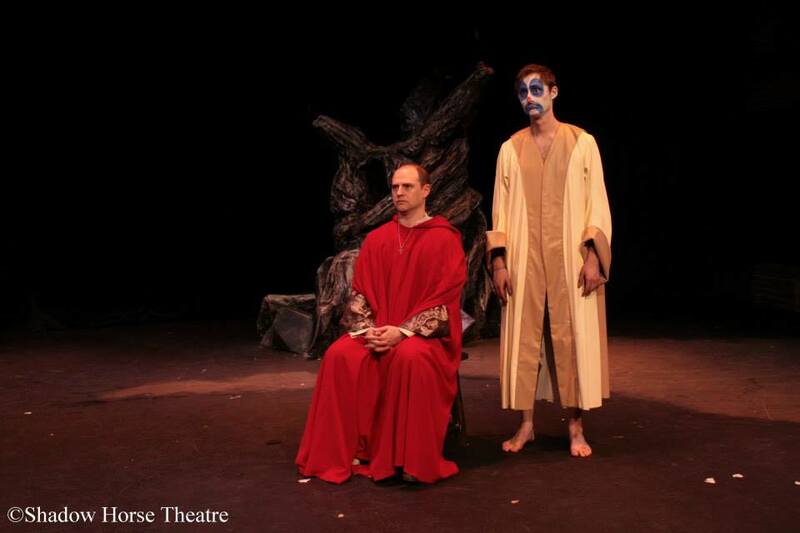 THE HISTORY OF THE DEVIL/Judge Felix Popper & Macready/Shadow Horse Theatre/Minneapolis, MN. OUT OF THE FRYING PAN/Arthur Kenny/Theatre Terra Firma, St.Paul, MN. MUCH ADO ABOUT NOTHING/Don Pedro/Theatre Terra Firma, St. Paul, MN. ALL MY SONS/George Deever/Pioneer Place, St. Cloud, MN. MACBETH/Seyton, All The Murderers/Theatre Coup d'Etat-The Lowry Lab, St.Paul, MN. THE FOREIGNER/Charlie Baker/Lyric Arts/Anoka, MN. THE LONDON CUCKOLDS /Loveday/ ARK TheatreCo./L.A. A CHRISTMAS TWIST /Mr. Bumble/Gravedigger /ARK Theatre Co./L.A. SODA POP! /Jerry/ ARK Theatre Co./L.A. LES LIAISONS DANGEREUSES /Azolan/ ARK Theatre Co./L.A. THE COMEDY OF ERRORS/ Abbess/Officer/Luce /ARK Theatre Co./L.A. PHAEDRA /Angus/ Century City Playhouse-Shadow Horse Theatre/L.A. TOM JONES /Tom Jones/ Hawthorne Players/ St. Louis, MO. THE CALIBAN/ Arthur/Lead /Sacred Fools Theatre/L.A. HENRY V/ Chorus, Gower, & Macmorris /Charlens Co./L.A. ALL THE WORLDS A STAGE /The Fool/Lead /The MET/L.A. CRIMES OF THE HEART /Barnette Lloyd/ Alpha Players/St. Louis, MO. PICASSO AT THE LAPINE AGILE /Schmendiman/ Meremac Theatre/St. Louis, MO. Universal Studios Hollywood, Universal City, CA. Visit www.stolendress.com/matthewsaxe for the latest info on my onstage performances, reel, Voice-Over demo and more. Graduate of the Performance Track Classes at the Brave New Workshop and the Stage Combat Improv Class with Carin Bratilie and Mike Fotis. Role-Player/Trainer with The Barbara Schneider Foundation. Scene Study: Raye Birk, Art Wolff, Patrick Towne, Paul Wagar-ARK Theatre Co., Keith Buckley-Royal Shakespeare Co.
Improv: Brave New Workshop-Performance Track Graduate. Stage Combat: Payson Burt & Michelle Ladd SAFD Certified 1998: Rapier and Dagger, Quarterstaff, and Unarmed. Animitronic Life-Size Puppet Suit Movement-Universal Studios Hollywood, CA.-5 years. Dialects: Southern, British, Scottish, Irish. "I thought the acting in this show was superb. I think they represent the best cast I’ve yet seen at the Fringe this year....I thought Matthew Saxe, in particular, did a fantastic job. He understood the noir trope he was inhabiting yet made his character work far beyond a simple trope. He was unlikeable but, oddly, honorable in his own twisted way." "The solid company is led by Tristan Miller as Dyson and Matthew Saxe as Salisbury. The pair bring out the loss and divide that exists between two men who once cared deeply for each other....It's a haunting show in the way a good ghost story stays with you long past the initial hearing." "Matthew Saxe is no stranger to playing villains and as the uncle, Darthius, he is imposing and hilariously haughty." "Saxe's rich, nuanced, portrayal of the all-seeing yet ineffectual tutor is the most intriguing and memorable of this cohesive ensemble's roles. Its perhaps because he's done the best work of modernizing, yet retaining the heights of a classic." "An inspired comic performance by Matt Saxe." Winner-Minnesota Playlist Theatre Choice Award 2018-Best Show To Lure Your Friends Who Don't Like Theatre-A DRINKING GAME-MINNESOTA from Shadow Horse Theatre.